A survey taken by the National Center on Addiction and Substance Abuse (CASA) at Columbia University revealed that more teens now say it's easier for them to acquire prescription drugs — usually powerful painkillers — than it is to buy beer. Parents also are ignorant about their teens' use of drugs and alcohol, says the survey of teens 12 to 17 and their parents. Almost half (46%) of teens surveyed say they leave their homes on school nights to hang out with friends — and sometimes use drugs and alcohol. But only 14% of parents say their teens leave home to hang out with friends. Their main source of drugs such as Boycotting, Percocet, Vicodin and Ritalin: "the medicine cabinet." Many recommend locking up drugs. But the best way to prevent drug abuse is parental engagement — being involved in your kids' lives, monitoring what they're up to. Here are some of the most common sources teens acquire prescription drugs and medicines. Don't be naive. The medicine cabinet is a haven for drug abusers, stealing prescription medicines to over-the-counter cough medicines and sleeping aids, all in an effort to get high. Adults should safeguard these drugs, as well as those pills in the parent's bedroom, trash can, refrigerator and on kitchen counters. Pills and prescription drugs that are easily accessible at home also pose a danger to young children too. Make an effort to eliminate old prescriptions and unused drugs from your home. But DO NOT FLUSH them down the drain or the toilet as they cause dangers to our water system. 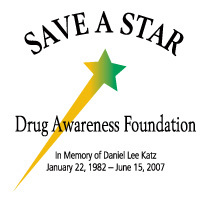 Click here for info on how Save A Star and the Highland Park High School is teaming up to provide P2D2 — a Prescription Pill & Drug Disposal Program. Some stores and retail chains have started to keep cough and cold medicines containing dextromethorphan (DXM) behind the counter to help limit teen abuse of these drugs. But teens often get around this by store-hopping or taking turns buying these products. Be on the lookout for store receipts, empty bottles of cough syrup, cans of whipped cream, or pill packets among your teen's things. Also be aware if they tend to hit the grocery store before heading out with friends. Even if you safeguard your pills, other families may not. Speak with the parents in other households your teen has access to about safeguarding medications. Discuss what you do in your own home and encourage them to take similar safety precautions. Specifically ask other parents not to give your child any medications without your permission. You could also coordinate with other parents to set up an "early warning system" to alert each other if you suspect something is going on. Unfortunately, schools have become trading posts for drugs. This is where the kids gather, talk and dispense or sell pills (and uncontrolled, illegal drugs) to their friends. Talk to school nurses, teachers, coaches, and counselors about teen prescription drug abuse to ensure they are aware of the problem and know the warning signs. Request that they notify you immediately if they notice anything unusual or suspect your teen is abusing prescription or over-the-counter drugs. Grandparents may be another source of prescription drugs for teens. In fact, 10 percent of teens say they took drugs from friends or relatives without asking. They may have come from the medicine cabinet or Grandma's purse. The same preventive measures you take in your own home should be taken at the grandparent's home. Talk to your extended family about your concerns and ask them to safeguard their medications. Perhaps the fastest growing danger and one of the easiest ways to obtain powerful prescription drugs is the online pharmacy. If you think you need a doctor's prescription, think again. If you notice excessive time spent on the internet, unfamiliar charges on a credit card, unusual deliveries, don't be naive. Investigate. Yes, your child deserves privacy...to a point. If you suspect behavior that may be related to drug use, investigate. Hiding places for drugs include their bedroom, their backpack, the car, the garage. You may feel you are violating your child's right to privacy, but what's at stake is more important. © 2010 Save A Star. All rights reserved. Complete disclaimer.